The Career Services Center has created several handbooks and​ guides for the benefit of the Ashland University community. Please follow the instructions below to access our guides. Check back for updates and revisions! Please download the Job Search Manual for Educators on the myAU Portal. You can find all our Handbooks and Guides under "Student Services > Career Services > Handbooks and Guides"
Click this link to go to the myAU Handbooks and Guides page directly. The Career Services Center also publishes the handbooks and guides to Google Drive. Visit our Google Drive folder to access the shared documents (you will need to log into your @ashland.edu account in order to access the file). Users of Ashland University's Google Drive may also add the entire folder to your personal drive to always have the most recent versions of our handbooks update automatically in the cloud. Click this link to view the Handbooks and Guides on Google Drive. Each of the handbooks and guides is also available in the Resource Library of AU Career Connect. 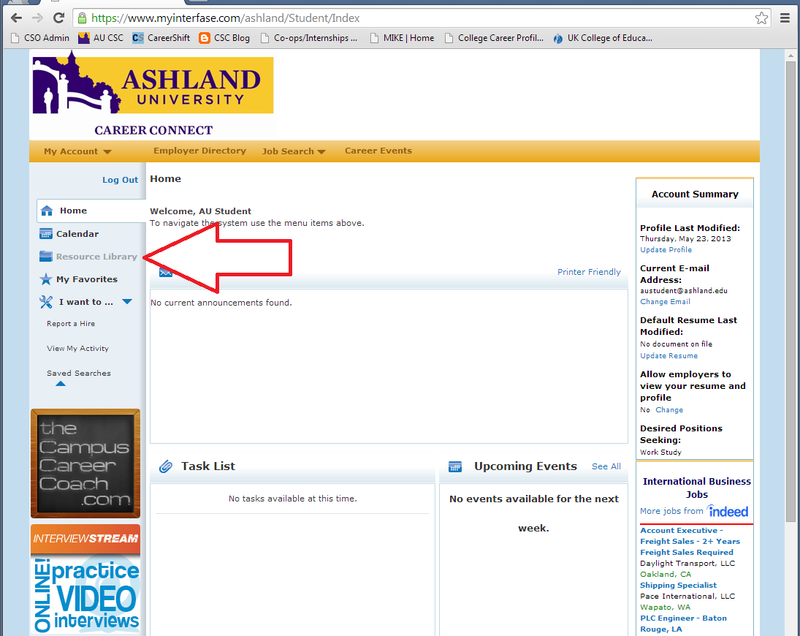 Simply log into your AU Career Connect account (or create an account for free). Once you are logged in, click on "Resource Library" in the left-hand column (see figure below) to access all of our handouts and guides. Click here to login to AU Career Connect,.